(b. 1955) – considered to be one of the most outstanding Irish writers and essayists. In his young days, one of his favourite writers was Hemingway. His books stimulated Tóibín's fascination with Spain. In 1975, he moved to Barcelona. He lived there for three years, taking an active part in anti-fascist manifestations. In 1990, he published his debut novel The South, which is partly based on memoirs of his stay in Spain. Its protagonist is a female artist who meets an anarchist, a participant in the Spanish Civil War, on her way in Barcelona. Motifs of travel and emigration keep recurring like a boomerang in Tóibín's works; they are present in his successive novels, including The Master based on a story of Henry James, Brooklyn or the aforementioned The South. 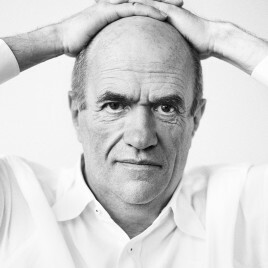 Colm Tóibín is also interested in the issue of emancipation and expression of homosexual identities; motifs of LGBT appear, for instance, in The Story of the Night and in a collection of essays Love in a Dark Time: Gay Lives from Wilde to Almodóvar.